IPOH: Come September, The Haven Lakeside Residences in Tambun will be showcased internationally by Tasweek Real Estate Development and Marketing at the world’s largest property expo Global Cityscape in Dubai. Tasweek Real Estate’s impressive portfolio includes marketing of the Burj Khalifa, the world’s tallest building in the world, and has set a record for pricing and sales of over 30,000 units including selling 1,300 units in one day during a property product launch. Tasweek’s chief executive officer, Masood Al Awar is all excited to introduce this unique value-for-money eco-development to its wealthy clientele in the Middle East. “We actively seek out first-mover advantage. The Haven in Ipoh is the right product in the right place at the right time. Our objective is to create wealth for our clientele. “Seeing is believing and that’s the reason why I have insisted my chairman come for this visit,” he said. Masood accompanied Tasweek’s Chairman, Mohamed Khalifa Ahmed M. Alfahed Almenhairi on a two-day visit to The Haven’s project site last week. They were briefed by Superboom managing director Peter Chan on his company’s third project. Chan said property prices at The Haven, a luxury eco-resort, were “a steal” as compared with properties in other states in Malaysia and this was part of the reasons why the project was selling well and attracting keen interest locally and internationally. “This is the first time a project in Ipoh is on investors’ radar both locally and internationally,” he said, adding that Tasweek’s collaboration with Superboom is a strong endorsement of The Haven. Chan said his company has started marketing the 165 units in Tower 3 where earthwork has just been completed. He said construction work on Tower 1 is already up to the 10th floor while piling has started in Tower 2. The alliance deal came in the wake of the appointment of Best Western International Inc, one of the world's largest hotel chains, to manage, market and lease The Haven’s condominium units internationally.Set for completion in 2013, The Haven Lakeside Residences will see its three 26-storey towers with 165 units each becoming the tallest buildings in Perak. Reputable contractors such as China's Beijing Construction & Engineering and Bina Puri Holdings Bhd have been awarded a RM109 million contract to construct the buildings. Superboom Projects Sdn Bhd has completed two other projects; the 576-unit Permai Lakeview Apartments in Ipoh and Subang Galaxy in Shah Alam, Selangor. KUALA LUMPUR: UEM LAND HOLDINGS BHD and Iskandar Investment are teaming up to develop retail and residential units in Nusajaya, Johor with a gross development value (GDV) of RM850 million. Both parties signed a shareholder agreement here on Thursday, June 9. 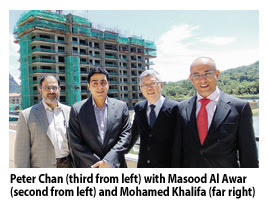 Iskandar Investment oversees the Iskandar Malaysia development. UEM Land managing director Datuk Wan Abdullah Wan Ibrahim said Nusajaya had seen significant progress with the mixed real estate projects in Nusajaya since projects were started in 1996. "That will lead to better profits for us going forward," Wan Abdullah said. He also said 2012 would be a "tipping point" for its development in Nusajaya within Johor's Iskandar Malaysia growth region. UEM Land Holdings Bhd, a Malaysian developer, agreed to develop retail and residential units in Nusajaya, Johor state, with Iskandar Investment Bhd that will generate RM850 million of sales, the Edge reported on its website. The companies signed an agreement in Kuala Lumpur today, the report said. Proud day: UOA chairman Tan Sri Alwi Jantan (right) and other board members at the listing. KUALA LUMPUR: UOA Development Bhd closed at RM2.59, one sen lower than its reference price of RM2.60 per share, after the stock made its debut on the Main Market of Bursa Malaysia yesterday. The counter opened at RM2.60 with 9.328 million shares traded. Based on its institutional price of RM2.60, the property developer currently has a market capitalisation of RM3.1bil. Speaking at a briefing after its listing ceremony yesterday, chief operating officer (development division) David Khor said UOA would work towards integrating more green building components in its commercial development. On its recent acquisition of a RM50mil land in Sri Petaling, Khor said the company planned to build high-end condominiums there but the details had yet to be finalised. “The company has about RM8.6bil worth of properties to be launched over the next seven to 10 years,” he said. Khor said about 70% of the properties developed by UOA were for commercial purposes while the rest were residentials. “We hope the ratio will change in two years, with residential projects contributing more (to the volume),” he said.